Kentucky State Police conducted a traffic stop on a 2017 Chevrolet on Monday, May 7 around 7:24 a.m. on Hodgenville Road 6 miles west of Campbellsville. The driver who was identified as 21 year-old Anshawn Francis of Hopkinsville, KY was observed driving at a high rate of speed while passing another motorist. During the investigation the driver was found to be operating on a suspended operator’s license and not wearing his seat belt. John Blunk, 50, of Hodgenville was lodged for reckless driving, possession of an open alcoholic beverage container in a motor vehicle, failure to maintain the required insurance and operating a motor vehicle while under the influence of alcohol or drugs. He was later released from LCDC. Blain Alec Spencer, 25, of Louisville was lodged for second degree disorderly conduct. He remains lodged in LCDC. Bryant Milby, 44, of Campbellsville was lodged for a warrant on second degree promoting contraband. He remains lodged in LCDC. Cory S. Marshall, 33, of Boston was lodged for a parole violation. He remains lodged in LCDC. David Garth McNear, 54, of Hodgenville was lodged for fourth degree assault. He was later released from LCDC. Two people were arrested at a local gas station in Hodgenville on Thursday, March 1 after several people complained about the two being high at the gas pump and causing a disturbance inside the gas station store. Those arrested were Amber Lynn Theademan, 30, of Wilmington, Ohio and Robert W. Kabler, 32, of Radcliff. Alexus Shontal Tilford, 24, of Bowling Green was lodged on warrants for operating a motor vehicle while under the influence of alcohol or drugs, driving too slow for traffic conditions, improper lane usage, failure to maintain the required insurance, failure to notify the transportation department of an address change and rear license not illuminated. Bradley Hovious, 36, of Magnolia was lodged on a warrant for menacing. Daniel J. and Tonya Snodgrass to Barry Eugene Glass Jr. and Megan Nicole Glass, property on Bennett Road, $93,000. Joshua and Tabitha Thornsberry to Joseph Mark Newton, property on Edlin Road, $114,900. Greg Ballard to Michael E. and Mary N. Evans, property in the Allen Farm 2 Agricultural Division, $70,000. Daniel Druchniak, 35, of Southgate, Michigan was lodged for flagrant non-support and failure to appear. Jerry W. Dye, 37, of Hodgenville was lodged for operating on a suspended license. Robert Thompson, 24, of Horse Cave was lodged for contempt of court, libel or slander and resistance to order. Russell Deandre Johnson, 25, was lodged for violation of a Kentucky EPO/DVO and violation of conditions of release. 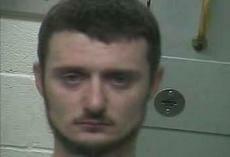 Cody Clan, 27, of Hodgenville was lodged for fourth degree assault. Detrick L. Love, 48, of Hodgenville was lodged for fourth degree assault. Kayla Clan, 23, of Hodgenville was lodged for fourth degree assault.